5. State Key Laboratory of Biotherapy and Cancer Center, West China Hospital, Sichuan University, and Collaborative Innovation Center for Biotherapy, Chengdu, 610041, China. In recent years, hand-foot-and-mouth disease (HFMD), which is caused by Enteroviruses, has emerged as a serious illness. It affects mainly children under the age of five and results in high fatality rates. Enterovirus 71 (EV71) is the main causative agent of HFMD in China and currently there are no effective anti-viral drugs available to treat HFMD. In the present study, we screened compounds for inhibition of proliferation of EV71. Compound YZ-LY-0 stalled the life cycle of EV71. The inhibitor exhibited EC50 value of 0.29 μm against SK-EV006 strain of EV71. Notably, YZ-LY-0 had low cytotoxicity (CC50 > 100 μM) and a high selectivity index (over 300) in Vero and RD cells. YZ-LY-0 in combination with an EV71 RdRp inhibitor or an entry inhibitor showed an antagonistic effect at very low concentrations. However, at higher concentrations the inhibitors exhibited a synergistic effect in inhibiting viral replication. Preliminary results on investigation of the mechanism of inhibition indicate that YZ-LY-0 does not block the entry of the virus in the host cell, but instead inhibits an early stage of EV71 replication. Our studies provide a potential clinical therapeutic option against EV71 infections and suggest that a combined application of YZ-LY-0 with other inhibitors could be more effective in the treatment of HFMD. Coxsackievirus (CV) and enterovirus 71 (EV71) are the main causative agents of Hand Foot and Mouth Disease (HFMD). Each year, more than a million people, a majority of them living in the Asia-Pacific region, fall sick with HFMD. Young children are more susceptible to HFMD because their immune systems are under developed [1,2,3]. Recently, adults have also succumbed to HFMD [4, 5]. Interestingly, infections caused by EV71 are more severe than those caused by CV. Symptoms like severe encephalitis, aseptic meningitis, pulmonary edema, acute flaccid paralysis, and myocarditis have been observed in patients infected with EV71, which can lead to death [6-8]. EV71 and CV both belong to the Enterovirus genus of family Picornaviridae . Their genomes contain a single-stranded positive-sense polyadenylated RNA of approximately 7400 nucleotides [10, 11]. Translation of the single open-reading-frame is initiated by ribosomes at an internal ribosomal-entry site located in the 5' untranslated region (5'-UTR) of the viral genome. This produces a polyprotein of approximately 250 kDa [12-15]. The polyprotein is further processed into four structural proteins, VP1-VP4, that are used for the formation of the viral capsid, and seven structural proteins 2A-2C and 3A-3D, including two viral proteases, 2A and 3C, together with a protease precursor 3CD [16, 17]. In contrast to CV, EV71 can infect the central nervous system as well as the pulmonary system and cause severe infection, including death . Vaccines are currently being developed to combat these viruses. Some of the vaccines have shown high efficacy and sustained immunogenicity in clinical trials. There are currently no drugs in the clinic to treat the deadly symptoms caused by EV71 infections . A large number of inhibitors targeting multiple processes of the EV71 lifecycle have been identified and are at preclinical research stage . For instance, an adenosine nucleoside analog NITD008 has been shown to inhibit RdRp activity in EV71 [22, 23]. Similarly, rupintrivir (AG7088) inhibits the function of EV71 protease 3Cpro [7, 17, 24], and pleconaril, GPP-3 and cyclosporine A block virual entry into host cell [25-27]. The recently approved pediatric drug suramin identified as a clinical candidate for the treatment of EV71 infection inhibits EV71 infection in vitro and in vivo . However, there is still much to be done before many of the reported inhibitors can be advanced as clinical therapeutics. In the present study, we screened a number of chemical compounds targeting the viral protease and identified a compound, YZ-LY-0, that can inhibit the proliferation of various strains of EV71 in human (RD and 293T) and monkey (Vero) cell lines. YZ-LY-0 is effective during the early stages of viral infection, and can efficiently inhibit viral RNA replication. The antiviral activity of YZ-LY-0 is not cell type or strain dependent. 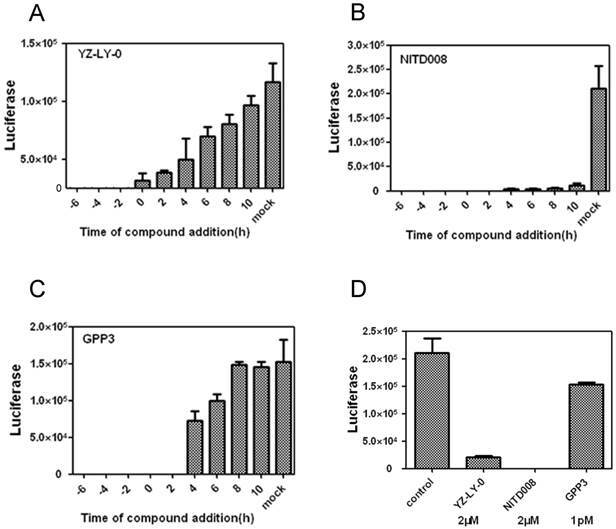 Combination of YZ-LY-0 with NITD008 or GPP3 revealed an antagonistic effect of the compounds in inhibition of viral replication at low concentration, which became synergistic at higher concentrations. All these findings suggest that YZ-LY-0 can be potentially developed into an anti-viral drug for the treatment of EV71 infections. Human rhabdomyosarcoma (RD) (China Center for Type Culture Collection, Accession No.TCHu45) cells, the human embryonic kidney 293T cell line and African green monkey kidney (Vero) (ATCC, accession No.CCL-81) cells were grown in Dulbecco's modified Eagle's medium (DMEM, GIBCO) supplemented with 10 % fetal bovine serum (FBS, GIBCO) at 37 ˚C in a 5 % CO2 humidified incubator. The initial phenotype screening was performed using EV71 strain SK-EV006 (Accession code: AB469182.1) and EV71-GFP (contains a GFP reporter gene inserted into the genome of SK-EV006). A single round pseudo-type EV71 reporter virus system (EV-71(FY)-Luc pseudo-type virus system) containing plasmids of pcDNA6-FY-capsid and pEV71-Luc-replicon lacking the P1 region was kindly supplied by Prof. Wenhui Li from the National Institute of Biological Sciences, Beijing. The plasmids containing human EV71 strain AnHui1 (Accession code: GQ994988.1) and BrCr (Accession code: U22521) were kindly provided by Prof. Bo Zhang and Prof. Hualin Wang from the Wuhan Institute of Virology. The chemical compounds were synthesized and purified by distillation. Stock solutions (10 mM) were prepared in distilled water with a final concentration of 0.1 % dimethyl sulfoxide (DMSO). Before use, we diluted the stock solutions with 10 % FBS/DMEM to various concentrations. The TRIzol reagent and the Super Script III First-strand 1 Synthesis System for RT-PCR kit were obtained from Invitrogen. The QuantiTect SYBR Green RT-PCR kit was purchased from Qiagen. The MEGA script T7 High Yield Transcription kit was procured from Promega. The cell viability and proliferation assay reagent (WST-1) was purchased from Roche. The EV71 pseudo-type virus (EV-71(FY)-Luc) was produced as described previously . The plasmid containing the pEV71-Luc sub-genomic replicon was first linearized by using Sal I restriction enzyme and then used as a template for RNA transcription. The EV71 replicon RNA transcripts were prepared in vitro using Promega MEGAscript Kits. The pcDNA6-FY-capsid plasmid was transfected into HEK-293T cells at 60-80 % confluence. At 24h post-transfection, the EV71 sub-genomic replicon RNA was transfected with Lipofectamine 2000 (Invitrogen). The EV71 pseudotype virus was collected 24 h post-RNA transfection with two freeze-thaw cycles. The stocks were serially diluted 10-fold and incubated with the RD cells for 24 h at 37 °C and the EV71 pseudo-type virus was quantified. The cells were then collected and the luminescence was detected according to the manufacturer's protocol for the Bright-Glo Luciferase Assay System (Promega). For the inhibition assay, the EV71 pseudo-type virus stock solution was diluted to give 106 relative luminescence units (RLU) per well in a 96-well plate. Analysis of the reduction of virus titers in the supernatants was performed using the endpoint dilution assays (EPDA). RD cells (3×105 per well) were cultured in 24-well plate and incubated at 37 °C in 5 % CO2. Then, the RD cells were treated with serially diluted compounds ranging from 0.039 - 10 µM in the presence of 10 % FBS and 0.5 % DMSO. EV71 (Fuyang strain) at an MOI of 1 was used to infect the cells two hours later. For each concentration of the compounds, the supernatants containing the virus were added to 10 new 96-well plates and diluted from 10-1 to 10-8. The CPE of each well were observed after 72 h pi. The TCID50 was calculated using the Reed & Muench calculator. To measure the expression level of GFP in RD cells infected with EV71-GFP, the virus titers of EV71-GFP were determined. Briefly, we seeded 3×104 RD cells per well in 96-well microtiter plates. After culturing the cells overnight, EV71-GFP was serially diluted 10-fold with DMEM containing 10 % FBS (10-1 to 10-8-fold dilutions) and added to the RD cells. The plates were then incubated at 37 °C in 5 % CO2. The GFP expression level was monitored using an epi-fluorescence microscope after 3-4 days. For the living virus, virus titers were determined by endpoint dilution assays (EPDA). Firstly, 3 × 104 RD cells per well in 96-well micro-titer plates. After culture overnight, EV71 was serially diluted 10-fold with DMEM containing 10 % FBS (10-1- to 10-8-fold dilutions) and added to the RD cells, followed by a 3-4 day cytopathic effect (CPE) assay. The virus titer, expressed as the TCID50, was determined using EPDA. RD cells were seeded at 3 × 104 per well in 96-well microtiter plates. After overnight culture at 37 °C in 5 % CO2, the RD cells were treated with compounds diluted to form a gradient with a range of 0.039 to 10 µM. At 2 h pi, EV71-GFP virus at a multiplicity of infection (MOI) of 1 was added to infect RD cells. DAPI was used to visualize the nuclei, mark up the host cells, and EGFP was used to monitor the virus growth. 24 h pi, fluorescence microscopy was used to measure the GFP expression level. Determination of virus titer, the 50% tissue culture infectious dose (TCID50) was performed using by EPDA. The reduction in the viral genome content in the host cells after treatment with the compounds was determined using a qRT-PCR assay. Cells were seeded at 1 ×105 / well in 24-well tissue culture plates and were incubated with complete culture medium at 37°C in 5 % CO2, The culture medium was then replaced with medium containing the EV71 virus at a MOI of 1 and the serially diluted compounds in the presence of 10 % FBS and 0.5 % DMSO. After 24 h, the total cellular RNA was extracted using the TRIZOL reagent according to the standard protocols. Quantitative RT-PCR assays (for primer sequences, GADPH forward primer 5'-CCC ACT CCT CCA CCT TTG ACG-3' and reverse primer 5'-CAC CAC CCT GTT GCT GTA GCCA-3', EV71 5'UTR forward primer 5'-TGA ATG CGG CTA ATC CCA ACT-3' and reverse primer 5'-AAG AAA CAC GGA CAC CCA AAG-3') were performed using the QuantiTect SYBR Green RT-PCR kit (QIAGEN, Valencia, CA). EV71 and GAPDH transcript levels were determined using the ΔΔCT method . The percentage of inhibition was calculated as follows: % inhibition = (1-(average of compound-treated cells)/(average of control cells))*100. Each data point represents the average of three replicates in cell culture. The cytotoxicity of the compound was detected using the WST-1 cell proliferation and cytotoxicity assay kit (Catalog NO: 05015944001, Roche, USA). Vero (2×104 per well), 293T and RD cells (3×104 per well in 100 µl 10% FBS-DMEM medium) were cultured in 96-well plates at 37 °C under 5% CO2, followed by the addition of 50 µl of the compound solution with concentrations ranging from 0.39-100 µM. The cells were incubated at 37°C for 24 h, and then 10 µl of the WST-1 reagent was added to each well. The signals were read at 490 nm with a microplate reader (Bio-Rad, USA). The percentage of viable cells after treatment with the various concentrations of compound was calculated as follows: %inhibition = 100 × (OD490) treated sample / (OD490) cell control sample. The cells were lysed in a buffer containing 50 mM Tris-HCl (pH 8.0), 150 mM NaCl, 1 % NP-40, 0.5 % sodium deoxycholate, 0.1 % SDS, 2 mM EDTA, 1 mM NaVO4, 10 mM NaF, and protease inhibitors. A spectrophotometer was used to determine the expression level of the EV71 VP1 protein in the lysates. The proteins were separated using the sodium dodecyl sulfate polyacrylamide gel electrophoresis (SDS-PAGE) and transferred to NC membrane (Millipore). The NC membranes were blocked for 4 h with 5 % non-fat dry milk solution in Tris-buffered saline and then blotted with specific primary antibodies, and followed by incubation with secondary antibodies conjugated with horseradish peroxidase. The proteins were visualized using the chemi-luminescence generated by Clarity Western ECL substrate (BIO-RAD). The time-of-addition effect was examined for YZ-LY-0, NITD008 and GPP3. RD cells (3×104 per well in 100 µl 10% FBS-DMEM medium) were cultured overnight in 96-well plates at 37 °C under 5 % CO2 with saturated humidity. Then, the cells were treated with 2µM YZ-LY-0, 2 µM NITD008 and 1 pM GPP-3 either concurrent with 100 TCID50 of EV71(FY)-Luc (0 h) or at intervals of -6, -4, -2, 0, 2, 4, 6, 8 and 10 h post-infection (h pi). Another 96-well plate was treated with YZ-LY-0 (2µM), NITD008 (2 µM) and GPP3 (1 pM) and infected with EV71 (FY)-Luc after 6 h. After incubation at 37 °C for 24 h, the antiviral activity was determined as the percent reduction of the luciferase activity compared with the control cultures. Approximately 3×104 RD cells were seeded into each well of two 24-well plates. At 24h post seeding, cells were infected with EV71 (EV71-FY-Luc strain; MOI of 2.0) for 1 h at 4 °C. Subsequently, the viral inocula were removed, and cells were washed three times with cold PBS to remove unabsorbed viruses. At 0, 2, 4, 6, 8, 10, 12, 14, 16 h p.i., 2 µM compound YZ-LY-0 was added to the infected cells. As negative controls, 0.5 % DMSO was added to the infected cells. At 24 h p.i., culture fluids were collected, and viral titers were determined by a CPE assay. In another experiment, YZ-LY-0 at 2.0 μM was added to RD cells at different time points before or after EV71 infection (-6, -4, 0, 4, 8 and 10 h p.i). RD cells were infected with EV71 (EV71-FY-Luc strain) at an MOI of 2 for 1 h. After three washes with PBS to remove unbound viruses, cells were incubated at 37°C. At 14 h p.i, the relative total RNA of infected cells compared with the infected cells treated with 0.5 % DMSO was determined with qRT-PCR. Data are presented as mean ± SD of 3 independent experiments. To find out whether inhibition of EV71 by YZ-LY-0 was cell specific, we measured EC50 of the inhibition in RD, 293T and Vero cells. RD (3×104 per well), 293T (3×104 per well) and Vero (2×104 per well) cells were seeded in 96-well plates and cultured at 37°C in 5 % CO2 before the assay. The cells were treated with different compounds that had been diluted with range of 0.039-10 µM. EV71 Fuyang virus at a multiplicity of infection (MOI) of 1 was added to the 96-well plates. The RNA was detected by qRT-PCR, and the EC50 values for the various types of cells were calculated using Graph Pad Prism. RD cells (3×104 per well in 100 µl 10% FBS-DMEM medium) were cultured overnight in 96-well plates at 37 °C under 5 % CO2 with saturated humidity. RD cells were infected with three different strains of EV71, including BrCr (genotype A), SK-EV006 (genotype B) and Fuyang (genotype C), and then treated with YZ-LY-0. After overnight incubation, the levels of EV71 RNA remaining inside the host cells were measured using a qRT-PCR assay. RD cells were plated in 96-well microtiter plates at a density of 3 × 104 per well and incubated at 37 °C under 5 % CO2 with saturated humidity overnight. The RD cells were infected with the EV71 pseudo-type virus and treated with various concentrations of YZ-LY-0, NITD008 or GPP-3 alone, or in combinations for 24 h. Antiviral activities were determined based on the reduction of the luciferase activities in the cells. Differential surface plots at the 95 % confidence level (CI) were calculated and generated by MacSynergy II for inferring the interaction between the inhibitors . We screened an in-house small molecule library containing 50 compounds to identify potential inhibitors of EV71. An EV71 strain SK-EV006 (genotype B) tagged with GFP was used for the initial screening . The RD cells were infected with virus (MOI of 1) and immediately treated with various concentrations of compounds ranging from 0.039 to 100 µM. At 24 h pi, most compounds showed no anti-EV71 activity at a concentration of 20 µM and the infected RD cells still showed obvious GFP expression. However, treatment with compound YZ-LY-0 (Fig. 1A) achieved an apparent reduction in the expression level of the reporter GFP at a concentration of 0.63 µM (Fig. 1C). In addition, YZ-LY-0 conferred concentration-dependent protection against EV71 infection based on the measurement of the expression level of GFP (Fig. 1C). The anti-EV71 activity of YZ-LY-0 was further investigated by qRT-PCR. RD cells infected with EV71 virus (strain SK-EV006) were treated with various concentrations of YZ-LY-0 for 24 h and the levels of EV71 RNA remaining in the cells were determined by qRT-PCR. The results revealed that YZ-LY-0 produced a concentration-dependent decrease in the levels of EV71 RNA in the infected cells with an EC50 value of 0.29 µM (Fig. 1B). Moreover, it was observed that in the infected cells the expression of the VP1 protein of EV71 (the major component of viral capsid) but not the host glyceraldehyde-3-phosphate dehydrogenase (GADPH), a host house-keeping gene, was decreased as a result of the treatment of the virus infected cells with YZ-LY-0 (Fig. 1D). All these results support the inhibitory effect of YZ-LY-0 against EV71 proliferation. Because YZ-LY-0 can be considered as a potential protease inhibitor, it is important to know whether YZ-LY-0 affects viral replication rather than the entry process. A previously reported pseudo-type EV71 virus system was used to exclude the impact of virus re-infection . The plasmid containing the pcDNA6-FY-capsid followed by the EV71 sub-genomic replicon RNA lacking the P1 region was transfected into 293T cells and EV-71(FY)-Luc pseudo-type virus was collected at 24 h after RNA transfection. RD cells were infected with EV71(FY)-Luc pseudo-type virus and then treated with 2 µM of either YZ-LY-0 or NITD008 [22, 23] ( a reported polymerase inhibitor) or 1pM of GPP3  (a reported entry inhibitor) at -6, -4, -2, 2, 4, and 10 h pi, in which 0 h pi indicates supplying inhibitors immediately after viral infection. The results showed that the inhibition of EV71 by YZ-LY-0 did not depend on treatment time before 10 h pi (Fig. 2A). The treatments with YZ-LY-0 at -6 to 8 h pi showed the strongest antiviral effect, which is similar to the reported viral replication inhibitor NITD008 (Fig. 2B). In sharp contrast, the antiviral effect of GPP3 showed a dramatic decrease after 2 h pi (Fig.2C). We next directly transfected the EV71 subgenomic replicon RNA lacking the P1 region into RD cells and treated the cells with YZ-LY-0 (2 µM), NITD008 (2 µM), and GPP3 (1 pM). The results showed that YZ-LY-0 inhibited the replication of EV71 similar to NITD008 but significantly different from GPP3 (Fig. 2D). Because the use of transfection excluded the entry step of viral infection, all of these results confirmed that YZ-LY-0 inhibited EV71 proliferation by affecting the viral replication stage. YZ-LY-0 inhibited EV71 proliferation. (A) The chemical formula of YZ-LY-0. (B) The inhibitory effect of YZ-LY-0 on EV71 RNA measured by qRT-PCR. RD cells were infected by EV71 virus at a MOI of 1, with or without treatment at various concentrations of YZ-LY-0 (0.039-10 μM) for 24 h. The levels of EV71 RNA were quantified by qRT-PCR and the data was expressed as the percentage of the level of EV71 RNA compared with viral RNA in the cells without YZ-LY-0 treatment. Each data point represents the average of three replicates. (C) Concentration-dependent suppression of EV71 proliferation following treatment with YZ-LY-0. RD cells were infected by EV71-GFP virus at a MOI of 1, with or without treatment by various concentrations of YZ-LY-0 for 24 h. Results for concentrations 0.16μM, 0.63μM, 2.5 μM and 10μM are shown. DAPI was used to visualize the nuclei (top panel), mark up the host cells, and EGFP was used to monitor the virus growth (bottom panel). (D) Dose-dependent reduction of EV71 VP1 expression. The concentration of YZ-LY-0 in lanes 1-7 was 5.00, 2.50,1.25,0.63, 0.31 0.16,and 0 μM, respectively. The expression level of GAPDH was not affected by the treatment with YZ-LY-0. The anti-EV71 activities of YZ-LY-0 at different addition times. 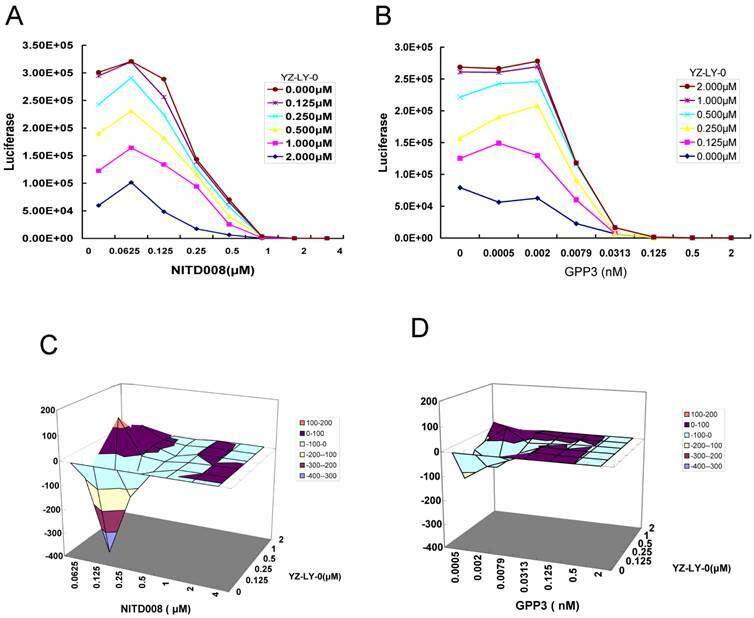 (A), (B) and (C) Inhibition of EV71 (FY)-Luc pseudotype virus infection of RD cells by YZ-LY-0 (2 μM), NITD008 (2 μM) and GPP3 (1 pM) at various addition times. EV71 pseudotype virus was used to infect RD cells in a 96-well plate and YZ-LY-0 was added simultaneously (0 hpi) or before and after viral infection as indicated on the figure (-6, -4, -2, 0, 2, 4, 6, 8 and 10 h p i). The luciferase levels were quantified by measuring the firefly luciferase activity in relative luminescence units (RLU) at 24 h p.i. (D) The EV71 subgenomic replicon RNA lacking the P1 region was transfected into RD cells. YZ-LY-0 (2 μM), NITD008 (2 μM) and GPP3 (1 pM) were added 4h prior to transfection. The luciferase levels were quantified by measuring the firefly luciferase activity in relative luminescence units at 24 h p.i. All results were presented as the average results of three independent experiments and SDs (n = 3) are presented. In order to conclusively determine the particular virus replication process that is being affected by YZ-LY-0, the time-of-removal of virus study was performed (Fig. 3). The results showed that compound YZ-LY-0 added at > 6 h p.i. gradually lost its potency, suggesting that the compound exerts its inhibition at the viral RNA replication step or at a late stage of the infection cycle after viral entry. YZ-LY-0 inhibited progeny virus production by nearly 100 % when added within 4 h p.i (Fig. 3A). A significant increase in virus yield (about 50 %) was observed when YZ-LY-0 was added 8 h p.i. One of the major events during the early stage of EV71 infection is viral RNA replication. To determine the effects of YZ-LY-0 on viral RNA replication, a time-of-addition experiment was performed and the EV71 RNA of infected cells was quantified using qRT-PCR. Similar to the inhibition of virus production, YZ-LY-0 inhibited EV71 RNA replication by nearly 100 % after 4 h p.i. (Fig. 3B). The inhibitory effect diminished after 8-10 h p.i. These findings suggest that YZ-LY-0 could efficiently inhibit EV71 RNA replication during the early stages of the viral infection. To assess possible cell-type and species-dependent differences in the anti-EV71 activity of YZ-LY-0, its antiviral effects in RD, 293T and Vero cells were examined (Fig. 4). The results revealed that YZ-LY-0 suppressed the viral RNA yield of the EV71-infected RD, 293T and Vero cells, respectively, in a dose-dependent manner. The EC50 values for YZ-LY-0 against EV71 SK-EV006 live virus infection in RD, 293T and Vero cells were 1.51 μM, 2.68 μM and 0.91 μM, respectively (Figs. 4A, 4D and 4G). The reduction in the virus titers was determined after the treatment with YZ-LY-0 in EV71-infected RD cells and the results indicated that the titers of the virus in the supernatants were also significantly attenuated by the treatment of YZ-LY-0 (Figs. 4B, 4E and 4H). The relative total virus yield (A) and the RNA of infected cell compared with that of the viral control was determined by time-of-removal analysis(B) . (A)RD cells were infected with EV71 (EV71-FY-Luc strain) at an MOI of 2 for 1 h. After three washes with PBS to remove unbound viruses, cells were incubated at 37°C. At the indicated time points, compound YZ-LY-0 (2.0μM) was added to the infected cells. As controls, the infected cells were treated with 0.5% DMSO. At 24 hp.i., the culture medium was collected, and viral titers were determined by CPE assay. Average results and standard errors (n=3) are presented. (B) YZ-LY-0 at 2.0μM was added to RD cell at different time points before or after EV71 infection (-6, -4, 0, 4, and10 h p.i).RD cells were infected with EV71 (EV71-FY-Luc strain) at an MOI of 2 for 1 h. After three washes with PBS to remove unbound viruses, cells were incubated at 37°C. At 14 h p.i, the relative total RNA of infected cells treated with YZ-LY-0 compared with a control group made up of infected cells treated with 0.5% DMSO only was determined with qRT-PCR. Data are presented as mean ± SD of 3 independent experiments. Quantification of the anti-EV71 effect of YZ-LY-0 in different cell lines. (A), (D) and (G) RD, 293T and Vero cells were treated with YZ-LY-0 and infected with EV71 strain Fuyang virus. EV71 RNAs were measured using qRT-PCR at 24 hpi. (B), (E) and (H) RD, 293T and Vero cells were treated with YZ-LY-0 and infected with the living virus of EV71 strain Fuyang. The virus titers in the supernatants were determined at 72 hpi. All results are presented as the average results of three independent experiments and SDs (n = 3) are presented. (C), (F), and (I) Cytotoxicity in different cell lines. RD, 293T and Vero cells were incubated with YZ-LY-0 at the indicated concentrations for 24 h. The cell viability was measured using a WST-1 based assay. The cyto-toxicity of YZ-LY-0 was also tested in RD, 293T and Vero cells. The results revealed that YZ-LY-0 has no obvious toxicity at a high concentration of 100 μM in RD and Vero cell lines, and the CC50 in 293T is significantly more than 30 μM, and thus, toxic to HEK293 cells at this concentration (Fig. 4C, 4F and 4I). 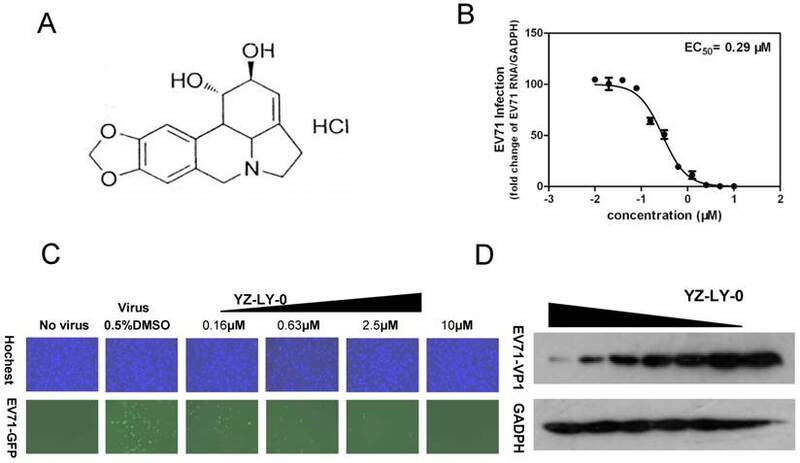 These result indicate that YZ-LY-0 has a strong inhibitory activity against EV71 and a high selectivity index (SI = CC50/EC50) value (up to 300 in RD and Vero cells). EV71 is generally characterized in terms of three genotypes - A, B and C. To determine whether YZ-LY-0 has an antiviral activity against all these three genotypes of the virus, an additional test was performed. As showed in Figure 5, YZ-LY-0 effectively inhibited the CPE induced by infection of these viruses with an EC50 similar to that observed for EV71. The results showed that YZ-LY-0 effectively inhibited the living viruses of the BrCr, SK-EV006 and Fuyang strains in RD cells with EC50 values of 1.12 µM, 2.53 µM and 2.43 µM, respectively (Fig. 5A, 5B and 5C). Thus, YZ-LY-0 is not strain specific and could be developed into a broad spectrum drug for treatment of EV71 infections. Because the inhibition of each step of the viral life cycle can affect the proliferation of virus, it has been proven in the clinic that a combination therapy with multiple drugs having different mechanisms of action can be more effective for treating viral infections, including HIV and HCV . Therefore, we tested the effect of YZ-LY-0 in combination with polymerase (NITD008) or viral entry (GPP-3) inhibitors on the proliferation of EV71. The former is the first identified potent nucleoside analog inhibitor of EV71 RdRp [22, 23], while the latter has been reported as an inhibitor of viral entry into host cells . The single round pseudo-type EV71 virus reporter system was used. RD cells were infected with EV-71(FY)-Luc pseudo-type virus and treated with various concentrations of YZ-LY-0, NITD008 or GPP-3, either alone or in combination for 24h. The results showed a concentration-dependent inhibition of EV71 replication with YZ-LY-0, NITD008 or GPP-3 alone, or with any two inhibitors in combination. Combination of YZ-LY-0 with NITD008 (Fig. 6A), or YZ-LY-0 with GPP-3 (Fig. 6B) showed attenuated inhibition when compared to inhibition exerted by individual inhibitors. The data were further analyzed using MacSynergy II, a mathematic model, to determine whether the effect of the combinations was synergistic, additive, or antagonistic . The results indicated that the combination of YZ-LY-0 and NITD008 at the concentrations of <0.25 μM for NITD008, and <0.002 μM for GPP3, had less antiviral activity than the sum of individual inhibitions. However, at higher concentrations the interaction between YZ-LY-0 and NITD008 or GPP3 became synergistic (Fig. 6C and 6D). 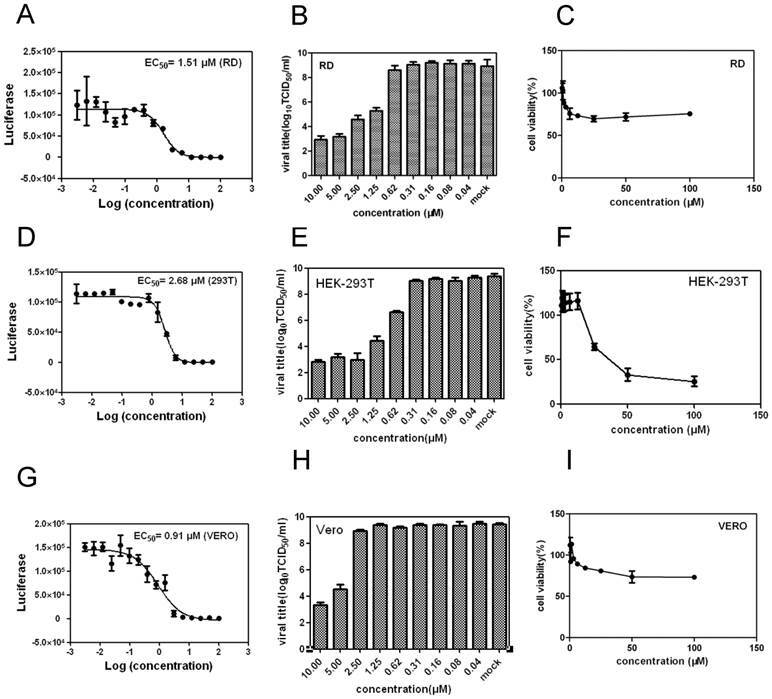 The effects of YZ-LY-0, NITD008 and GPP-3 on cell viability were previously evaluated to ensure that the inhibition of EV71 was not due to cytotoxicity. No significant cytotoxicity was observed with the combination of YZ-LY-0 and the other two compounds (data not shown). Quantification of the antiviral effect of YZ-LY-0 on different virus strains. (A), (B) and (C) RD cells were treated with YZ-LY-0 and infected by the living viruses of EV71 strain BrCr (genotype A), strain SK-EV006 (genotype B) and strain Fuyang (genotype C). The remaining levels of EV71 RNA in the cells were determined using the qRT-PCR method. Drug-drug interaction of YZ-LY-0 with other inhibitors of EV71 proliferation. (A) and (B) The anti-EV71 effects of the combination of YZ-LY-0-NITD008 and YZ-LY-0-GPP-3. RD cells were treated with various concentrations of YZ-LY-0, NITD008 or GPP-3 alone, or in combinations and infected with EV71 pseudovirus for 24 h. Antiviral activities were determined by measuring the reduction of luciferase activity in the cells. Each data point represents the average of three replicates in cell culture. (C) and (D) Differential surface plots at the 95% confidence level (CI) were calculated and generated by using MacSynergy II for the drug-drug interaction of the combination of YZ-LY-0-NITD008 (Fig.C) and YZ-LY-0-GPP-3 (Fig.D).The 3-dimensional plot represents the differences between the actual experimental effects and the theoretical additive effects at various concentrations of the two compounds in combination. Only statistically significant(95% CI) differences between the two compounds were considered at any given concentration. Peaks above the theoretical additive plane indicate synergy, whereas depressions below it indicate antagonism. The colors indicate the level of synergy or antagonism. In the present investigation, Vero, 293T and RD cell-based systems were used to evaluate the anti-EV71 effect of YZ-LY-0. By screening small molecule compounds from our in-house library, we identified YZ-LY-0 that potently inhibits all the three strains of EV71 tested in the current study. YZ-LY-0 had no obvious cytotoxicity even at a high concentration of 100 μM in RD and Vero cell lines. YZ-LY-0 showed effective inhibition against EV71 infection in three different types of cells, suggesting that such antiviral activities are not cell-type dependent. To understand the mechanism of action and to identify the target of YZ-LY-0, we attempted to select YZ-LY-0-resistant virus through continuous passage of EV71 in the presence of the compound. However, after 10 passages, EV71 remained sensitive to the compound with similar EC50 values (data not shown). More detailed analyses of the exact mechanisms of action of the compound are currently being conducted. EV71 infection-induced CPE was measured through CPE inhibition assay. The similarity of the EC50 obtained from three different cell lines for YZ-LY-0 suggests that the compound does not inhibit cell growth directly, and the cyto-toxicity assay indicated that YZ-LY-0 is a good inhibitor of EV71 infection. The combination of YZ-LY-0 with NITD008 or GPP3 exhibited a strong antagonistic effect during inhibition of EV71 at lower concentration (concentration of NITD008 and YZ-LY-0 as low as 0.125 µM). In sharp contrast, when the concentration of YZ-LY-0 was increased to 0.5-2.0 µM, the interaction between NITD008 and YZ-LY-0 became synergistic. Moreover, the interaction of YZ-LY-0 with GPP3 was not as significant as that of NITD008-YZ-LY-0. However, the antagonistic effect of YZ-LY-0 with GPP3 at lower concentrations and the synergistic effect at higher concentrations presented similar trends as that of NITD008-YZ-LY-0. These results suggest a potential application of YZ-LY-0 in combinatorial therapy. Inhibitors targeting different aspects of the life cycle of EV71 could be combined with YZ-LY-0 to treat EV71 infections. Although the details of the EV71 life cycle are unclear, it generally involves virus attachment, uncoating, polyprotein translation and cleavage, viral RNA replication, and assembly of the virus [9, 35]. These critical steps are currently considered targets for antiviral development . Compounds that target some of these processes are being actively pursued . Nucleoside analogues have been successfully used for treatment of several viral infections, e.g. HIV and HBV . Picornaviruses can complete their lifecycle in approximately 8 h, at which point, host protein production is shut down and CPE is induced. At 3-4 h pi, viral protein synthesis is predicted to reach high levels and virus assembly could even be initiated at this point . For YZ-LY-0, the EC50 for VP1 production is similar to the EC50 for progeny virus production, which is consistent with the finding that YZ-LY-0 inhibits viral RNA replication within 4 h pi. YZ-LY-0 also showed inhibitory activity against three other human EV71 strains, and we have every reason to believe that the anti-viral effect is not strain dependent (Fig. 5). In conclusion, YZ-LY-0 could effectively inhibit the infection of EV71 in different types of cells. In addition, our studies using RD cells show that YZ-LY-0 inhibits proliferation of different strains of EV71 that infect humans. YZ-LY-0 could be used as a scaffold to improve the potency and desirable drug-like properties for treatment of EV71 infections. In addition, using YZ-LY-0 as a probe, a study of the mechanism of action would enhance our understanding of the molecular mechanism of enteroviral infection and transmission. This work is supported by the National Major Project (973 Program). Corresponding authors: Zhiyong Lou, School of Medicine, Tsinghua University. Beijing 100084, China, Tel: +86-10-62771493, Fax: +86-10-62773145, email: zhiyong.loucom; Zheng Yin, College of Pharmacy & State Key Laboratory of Elemento-Organic Chemistry, Nankai University, Tianjin 300071, China Tel: +86-22-23500963, Fax: +86-22-23507760, email: zhengyinedu.cn.